Meet Roger! Roger is intelligent and spends his days working crosswords or playing chess when the humans are away. He has a real knack for Sudoku puzzles, too. 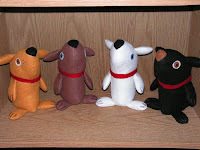 Roger is the fourth stuffiepup in the series, and there are two more yet to be made to complete the full set of them. With a busy weekend coming up, it'll most likely be next week sometime before they're finished. 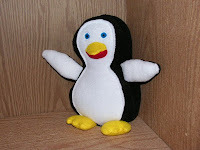 After I made a red penguin stuffie for a friend, another friend of mine has been wanting a penguin of his own, too. He hadn't told me what color(s) he wanted for his penguin so I hadn't made one yet. 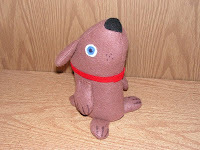 This week he got into a bad car accident. Thankfully he will be alright, and so I decided to just make a normal colored penguin stuffie to send as a get well gift. I think it turned out okay. I think I'm finally getting "sick" for the first time since I moved to Canada 9 months ago. I was amazed that I didn't get sick during the worst of the winter at all. Normally I get sick a few times in a single winter, but I've been lucky so far. I felt a little under the weather once, but it didn't last and I didn't really get full-on sick or anything. I've been feeling a bit sore and swollen in my neck glands recently and I finally started feeling a twinge of a sore throat yesterday. I'm hoping it's just a bit of a cold and I'll be able to combat it with Neo Citran and cold meds. Guess that means I'm gonna have to get working on stuffing those lambs... all four are waiting to be stuffed and sewn shut now, and that sounds like the perfect "lying on the couch getting plenty of rest" project.